On May 21, 2014, I introduced you to this family of hummingbirds who live in my neighbor’s courtyard. They started out in eggs that were the size of a jelly bean. Near the time of departing the nest, they barely fit inside. 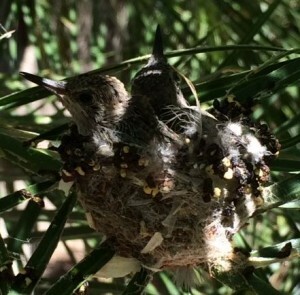 This photo was taken about a day before they left the nest. It has been amazing to see how fast they went from fuzzy chicks to fully feathered adults! 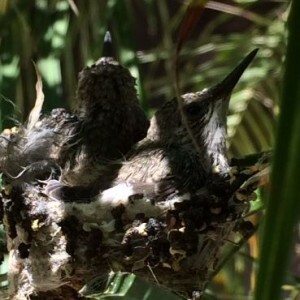 The first one left the nest approximately 21 days after hatching while the second one stayed a day longer.